PlayStation Vue Mobile for Android is a live TV streaming app that is rich in channel offering and limitless cloud based DVR. It is been a popular cable replacement option where people are looking out to save their money in terms of the ever increasing monthly bills by cable and satellite operator. Sony’s PlayStation Vue has been the ideal choice with better features than any cable can provide. The online service has packages ranging from $40 to $75 with no of channels ranging from 45 to 90. PlayStation Vue Mobile for Android comes with an intuitive interface and enough of tools to discover and search new shows and movies based on your liking and understand what’s popular among other viewers. The cloud based DVR is limitless and this is its biggest advantage when compared to other competitors. Not just the popular channels, they offer local sports and news as well. There are four plans in the offering, Access, Core, Elite and Ultra. Each has different no of channels and features. The base plan, Access for $40 per month, includes some of the major cable TV channels. Among them are AMC, Cartoon Network, CNN, Discovery, Food Network, Fox News. They also include ABC, Fox, NBC and CBS. More viewing options are available with the core plan for $45 per month along with additional sports channels. Elite includes everything in Core and about 2 dozen other channels for $54 per month. The ultra plan has premium channels like HBO and Showtime and is available for $75 per month. With Vue, if you make the right selection you will surely save a lot of money by saving your dollars on numerous channels present in the cable that you never want to watch. 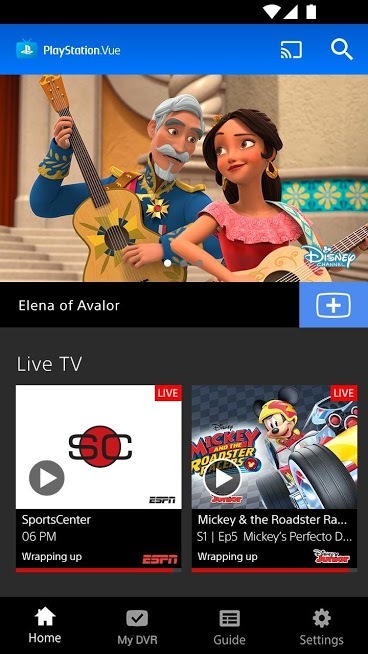 PlayStation Vue Mobile for Android is one of the most powerful cable substitutes and you can enjoy unlimited live TV with good internet connection and viewing device. The app offers one free trial for Access, Core, and Elite plans. The ultra plan does not have a free trial. The prices may fluctuate based on channel content, availability and features. The service is available in over 50 states of US.